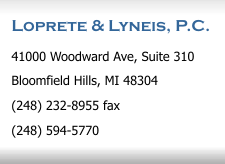 The attorneys at LoPrete & Lyneis, P.C. have collectively over 75 years of experience in representing both fiduciaries and beneficiaries in Estate, Trust and Guardianship/Conservatorship litigation. Contesting and defending challenges to a Will of Trust because of undue influence, lack of mental capacity or fraud. The construction or interpretation of Wills or Trusts which contain ambiguities or contradictory language, or fail to completely dispose of all of the assets. Challenging and defending claims against the Personal Representative, Trustee or Conservator for improperly administrating the estate or trust or the ward's property. Challenging and defending a Personal Representative's, Trustee's or Conservator's, accounting or the fees being charged. Challenging and defending actions to remove a Personal Representative, Trustee or Guardian/Conservator.